Shown in the photo is a disease called halo blight, caused by the bacteria, Pseudomonas syringae pv. phaseolicola. It is spread from leaf to leaf and plant to plant in windblown rain or irrigation water. The bacteria enter the plant through wounds and natural openings when the foliage is wet and during periods of high humidity. The disease affects the seed pods as well as the foliage. The first symptoms are small lesions resembling tiny pinholes on the underside of leaves. They rapidly dry and turn reddish brown and become visible on both sides of the leaf. These spots usually remain small, but a characteristic yellow zone, resembling a halo, often develops around the lesions. They can be of irregular size and shape. Symptoms on the bean pods begin as tiny spots gradually enlarging to form dark sunken lesions. Infected pods are discolored and shriveled. Control: There is some resistance to this blight. 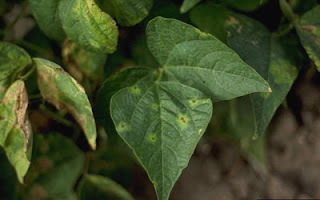 For instance, navy and small white bean cultivars along with some red kidney bean cultivars are resistant to halo blight. Check for resistant varieties in the type of bean you desire. Since the disease is spread by rain, it would help to provide some type of cover that would lessen water droplets falling on the plants. Although these products will not eradicate the disease, copper based bactericides can reduce infection and protect healthy tissue. Do not plant beans in the same location for 3 years. 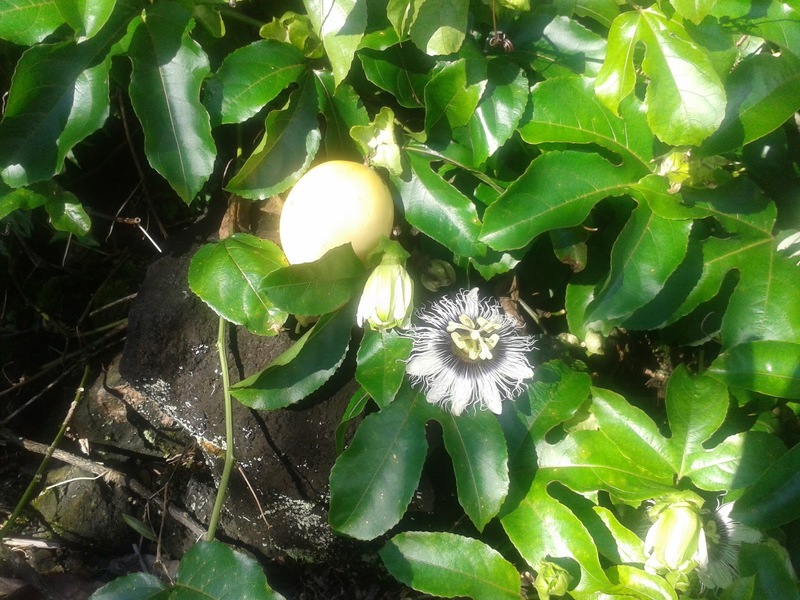 How long will Passionfruit Vines live? The passionfruit vine, or Lilikoi, as it is known on the Hawaiian Islands, is a relatively short lived plant. Some vines may produce for only 3-4 years, while others can last a decade. They will generally not die outright, but rather the yields will begin to decline. Commercial growers should keep harvest records, and when yields begin to drop, replanting is necessary. Backyard growers don’t have to be so quick to pull the plants since tolerate less fruit is more tolerable. I have a vine that’s reaching the decade point and is producing quite well. Since I don’t keep records though, I can’t tell if my yields are down. Commercial strawberry growers have a similar situation. In the Southern US, plants remain in the ground for 3 or 4 years. After each season though, yields decline as the population of pathogenic organisms, such as nematodes and a variety of fungi, increase and attack the roots. In contrast, California strawberry growers remove the plants, fumigate the soil and replant each year. Because of this practice, yields remain high each year. I planted some seeds and only a few came up. Several elements are essential for seeds to germinate. Water is, of course, number one. But seeds must also have an adequate supply of light, oxygen and the proper temperature range. In a few cases seed need darkness to germinate. Seeds can be buried too deep, or too close to the surface where birds or wind may carry them away. This is often true of carrot seeds. Furthermore, the possibility of disease, fungi and bacteria, in the ground can rot the newly planted seeds. Some seeds need special care. Certain ones have seed coats which are extremely thick. Particular care must be taken with these in order for the water to penetrate that coat. Soaking in warm water is one means. Seeds such as lupine, locust (Robinia) and others need to be scarified, which means they need to be mechanically scratched in order for the water to penetrate. This may be done with common instruments like sandpaper or a file. Soaking in hot water is another means of scarification. Still other seeds will not germinate, or break dormancy, unless they are exposed to a period of low temperatures and moist conditions. Certain seeds germinate only after a fire. Not all seeds are created equal. Store dry, clean seeds in an airtight container marked with their name and date saved. Store around 40 degrees F with low humidity. The refrigerator is a good place for this. Seeds of many plants remain viable for up to 5 years, if properly stored. Some plants like delphinium, onion and parsley, produce seeds that must germinate immediately after they ripen or they lose their viability. If you have old seeds, or seeds of questionable viability, place some of them between a paper towel that is kept constantly moist and between 65 and 70 degrees F. Check daily for germination. If the rate is poor, consider buying new seeds.